Driving the backroads today I was scouting flooded areas of which there are many. 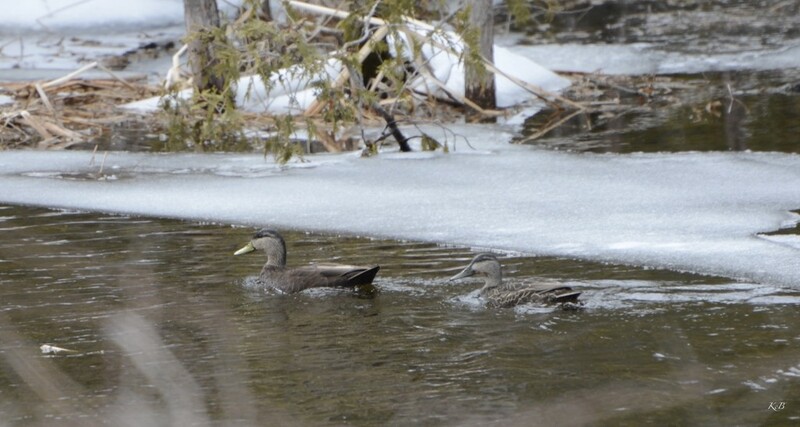 I came across a couple of, new to me, migrating ducks. The first was this pair of American Black Ducks. Black Ducks used to be the most common duck in Ontario but have been overrun by the more highly adaptable Mallard. When I took this pic I couldn't identify them and still couldn't identify with my books...just Ducks. I mention this because I downloaded the Merlin bird ID app on my phone yesterday. I used it today and found the species. I recommend the app if you don't have it. Oh a little ice and water with your ducks! Great find, I will have to check out that app! Is this the app that you take a photo with your phone and it identifies the bird? @radiogirl @bkbinthecity @bruni @taffy Thanks for stopping by. I'm always delighted to identify a bird I've only seen in books or in some cases old decoys. @janeandcharlie The app I used is produced by Cornell Labs and once identified will add to their data base. It will identify either with a photo or by answering a few generic questions. I used the question method.